So I’ve determined that for the next few posts I will alternate between a meal and the cocktails and dressing series. I won a herb garden from a fundraising event I recently attended and have been testing out my green thumb to support both dishes and drinks. When a friend of mine brought me some fresh Louisiana pecans, I thought that would be great with some herbs in a fish dish. I had some catfish on hand from a previous indieplate.com order and some veggies from my farmers market trip and below is the creation that came from it. Hope you enjoy it if you try it and share your thoughts! 2. Wash and dice the potatoes and add the potatoes and half of the onion to a large skillet over medium heat. 4. Rinse out pan and add coconut oil over medium heat. While heating, add 1 ½ tsp of each seasoning to the fish (add 1 tsp of cayenne to each to boost the heat). Place in heated skillet seasoned side down and season the other side with the same amount. Sear on each side for 3 minutes. 5. While the fish sears, rinse green beans and cut off rough ends. You can leave them whole or cut in half. Add green beans and remaining onion to a small pan over medium heat with ¼ cup of water and remaining seasoning. Once it begins to boil, cover and reduce heat to medium low. 6. Once fish is browned make room in the pan and add back in the potatoes and onion to continue cooking. Add another ¼ cup of water. Top and reduce heat to medium low. 7. Let green beans and fish cook for an additional 5 minutes. 8. In a small saucepan, melt butter over medium heat. While the butter melts chop pecans and herbs before adding to saucepan. Stir every 30 seconds for 2 minutes to lightly toast the mixture. Do not let the nuts burn. 9. Turn off all pots. Plate potatoes, then top with the fish and add half of the pecan mixture to each fillet. Add green beans beside the fish and sprinkle 1 tsp of chives over each plate. This week has been all about 30- minute meals. I am a huge fan of one-pot or one-pan wonders with an easy clean up. 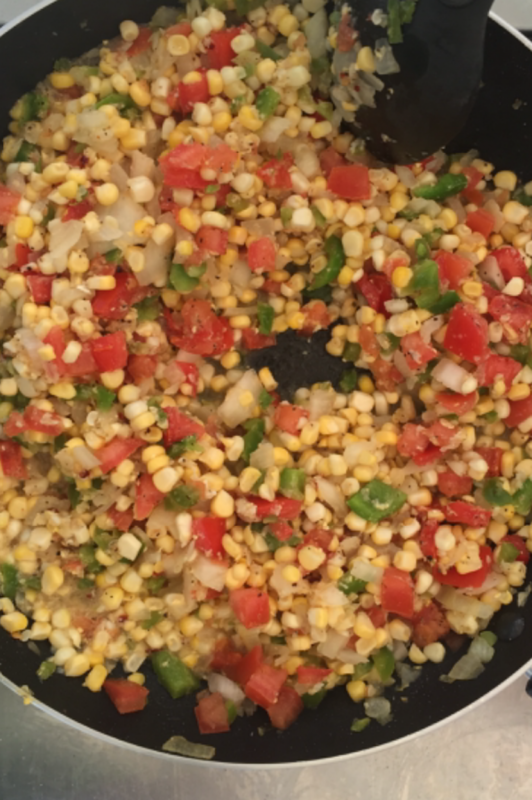 This is a versatile dish where both the protein and veggies can be changed with preferences. I used catfish as the protein in this dish but you can also use chicken or shrimp if preferred. When I ordered my items from indie plate last week I also stocked up on some local catfish. It comes frozen and the great thing is it doesn’t have to be defrosted before cooking it. Regarding the mixed veggies you can really use whichever winter veggies you prefer. I picked up some Brussels sprouts, broccoli, turnips and fennel at the Farmers Market. The ingredients and recipe are posted below which serves two. 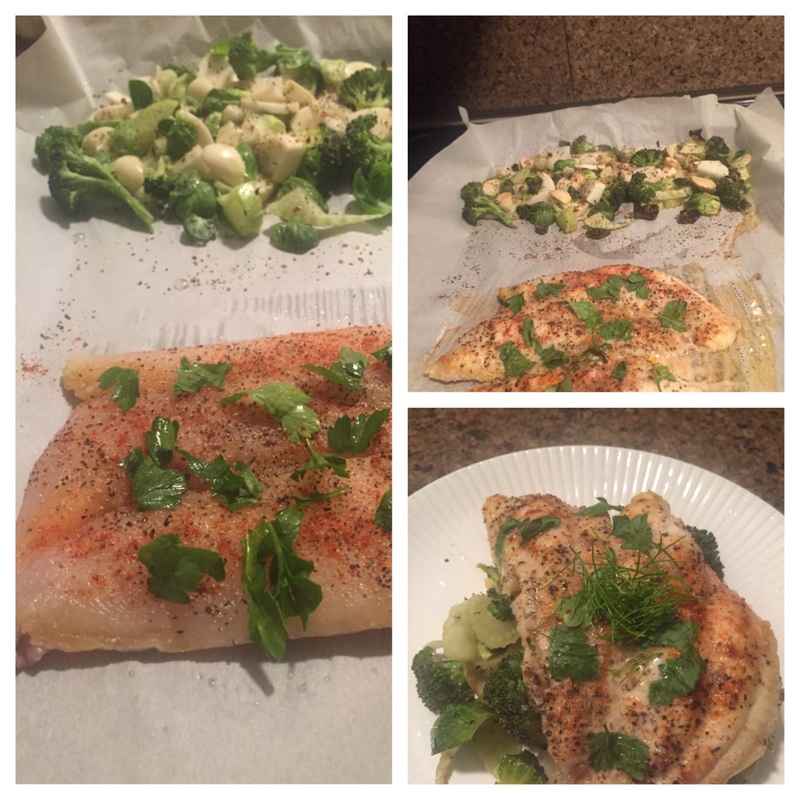 I decided to try documenting the stages of the cooking since it was easy and simple. If you are feeding four or more people, the recipe can be adjusted accordingly. 1. Preheat oven to 375 degrees and line a large cooking sheet with parchment paper or foil. 2. Cut ends off turnips and place the cut end down. Cut the turnip in half horizontally then slice into thin strips vertically. Place on one end of lines cooking sheet. 3. Cut Brussels sprout ends off and place cut end down before cutting each in half and adding to the baking sheet. 4. Cut thin strips off of fennel bulb then roughly slice the strips until you’ve cut about 1/4 of a cup and add it to the baking sheet. 5. Wash broccoli and break off the whole into smaller pieces. Peel 3 to 4 cloves of garlic and cut them into four pieces and add them and the broccoli to the baking sheet. 6. Drizzle olive oil over veggies and mix by hand until the veggies are evenly coated. Lightly sprinkle the seasonings in an even layer. 7. Take the frozen fish from the package and place it on the basing sheet. Drizzle on the olive oil and smooth in an even coat with a brush or by hand. Sprinkle seasonings in a even layer. 8. Place the tray in the oven for 15 minutes. 9. Remove from oven and let cool for 1-2 minutes before plating. Squeeze fresh lemon or lime over the fish and tip with optional fennel fronds if desired. To kickoff the Lent season, I have to start with my take on a Louisiana classic, Shrimp and Grits. This is a warm and inviting dish that can be made lots of ways. It was perfect and quick after my intense kickboxing class and certainly an easy dish to prepare after work on Friday. If you don’t have these ingredients at home, you can have most of them delivered to your front door with an easy order through www.indieplate.com which delivers local, farm fresh ingredients to your home. Check them out to see if you live within their delivery area and take advantage of their weekly deals and discounts. I actually placed my order midday Saturday that was delivered yesterday and was excited to try out the local, stone-ground grits that I have heard so much about. Below are the ingredients and directions. I hope it is as enjoyable for you as it was for me tonight. Please share if you like the recipe. 1. Measure milk into a measuring cup and let it come to room temperature. 2. Put two cups of water on boil in a medium-sized pot. Once it begins to boil, add the grits. 3. Add salt and stir the grits until well incorporated and then reduce heat to low. 4. Don gloves. Peel and devein shrimp while the grits cook. 5. Stir every 3-5 minutes and add milk and additional water in 1/2 cup increments until the grits are the creamy consistency of your preference. The grits will take 25-30 minutes. 5. Dice and mince the onion, garlic and scallions (green onion). Set aside green onion for the end of the dish and add other ingredients over medium heat with an inch of water. 6. Once onion and garlic are soft, sprinkle flour in an even coat and stir until flour starts to brown. Add Worcestershire sauce to pan and water and stir. 7. Sprinkle seasonings on shrimp before adding it and butter to the pan. Stir for three minutes and add the green onion. Turn off heat. The shrimp will continue to cook in the residual heat. 8. Add butter (and cheese if preferred) to grits and stir until melted. Salt to taste. Turn off heat.